How did the word “interesting” become irrevocably altered from a compliment to an insult? Nowadays when you hear someone describing a restaurant or a meal as “interesting”, the automatic assumption is that it was a completely un-repeatable experience filled with questionable choices. Even more perplexing and inconvenient is that the opposite of interesting (uninteresting) enjoys the same flavor of insult as well! 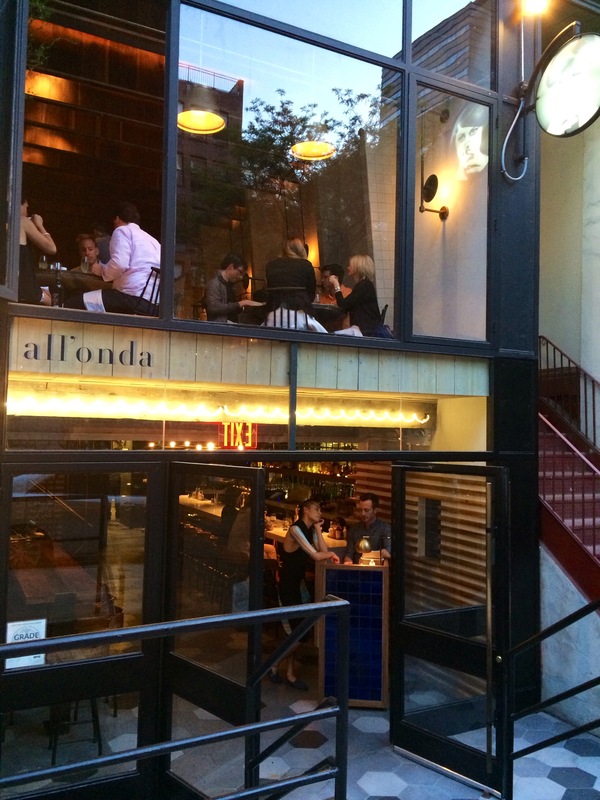 I therefore feel it absurdly necessary to disclaim right here and now that the concept behind Chris Jaeckle’s charming two-story, Greenwich Village Venetian bistro All’Onda is brilliantly interesting – in the original sense of the word. Given his solid record at being able to deliver on traditional, high-end Italian during this tenure at Michael White’s Altamarea group, Jaeckle has produced his own gimmick-free kitchen that catapults Italian cooking into the 21st century while bringing many familiar Japanese nods and influences along for the ride – and what a fun ride it is. The rustic brick-and-wood interior feels comfortable, fresh and unimposing. The staircase separates the noisier bar area from the more romantic upper level. (In case you’re wondering, the two “it” tables are the ones right up against the window facing tree-lined 13th street.) The staff seem to have all graduated from the same tone school of upbeat, friendly, knowledgeable and not too serious, and their countless journeys up and down the stairs keep them well toned too. 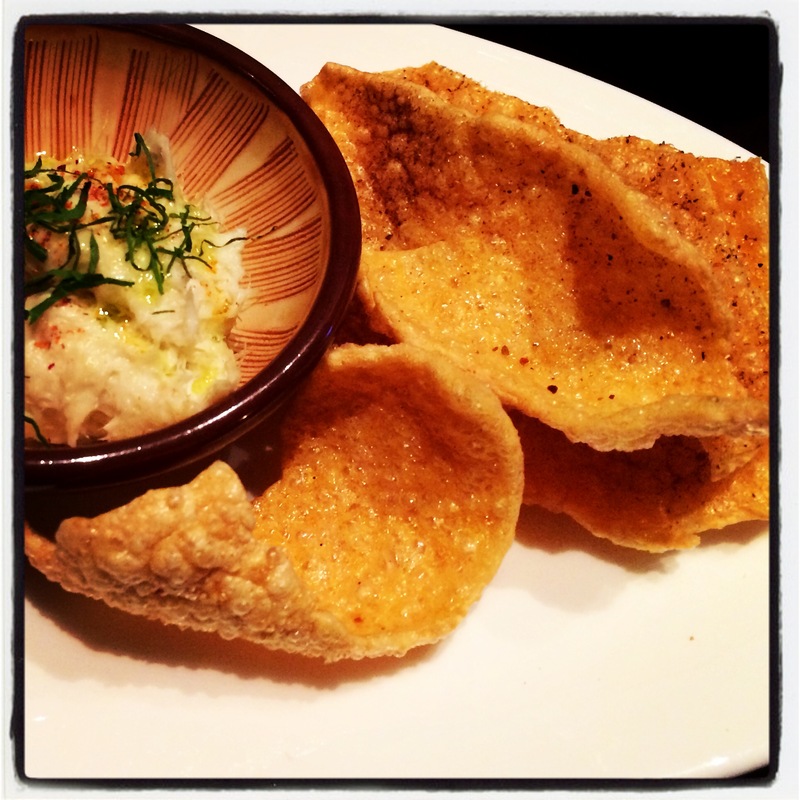 Let’s talk about the Polenta Chips with Bacalá (salted cod) for a minute. I used to think that I was very familiar with Polenta and its various texture options. I’ve eaten it soft, hard, droopy, soupy and dry, but never before have I encountered it crispy. After normal preparation, it gets dehydrated and then fried to a pork-crackling crisp, but not without a little cooperation from Mother Nature herself. Just like frizzy hair, excessive humidity can ruin this delectable treat and banish it from the menu. 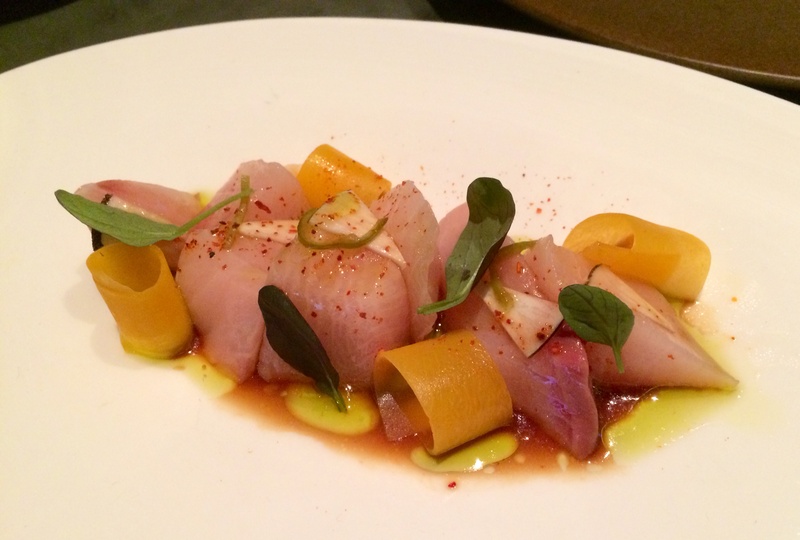 The Hamachi with Pepperoncino and Soy is transcendent. The best cut of Sashimi with a decidedly Mediterranean accent. And the cerignola green olive tapenade with wasabi (a little less flavor-forward than I had anticipated) gently transforms the Tuna into 3 little red blocks of sunshine. 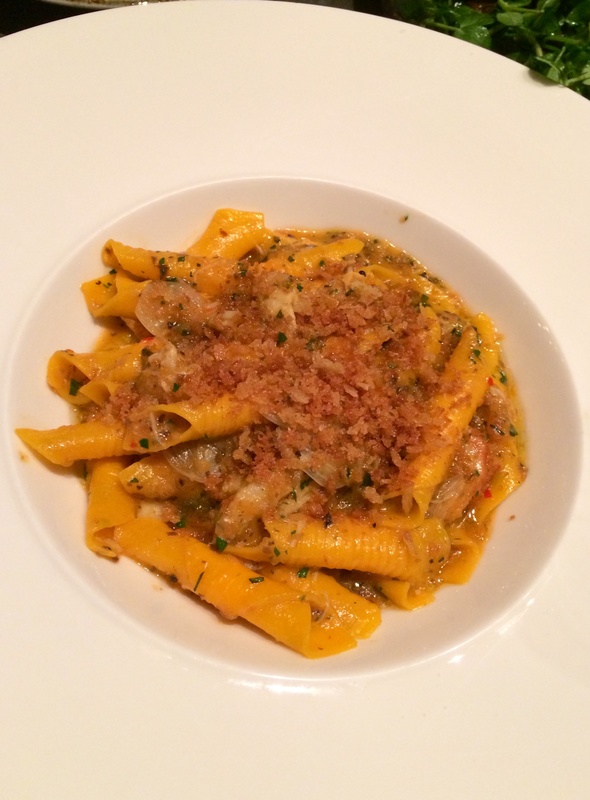 There was a delightful yet invisible crunch and plenty of salty/citrusy flavors in the Garganelli, but it did appear as if the preparation might have been a bit too rigorous for the delicate Peekytoe crab. 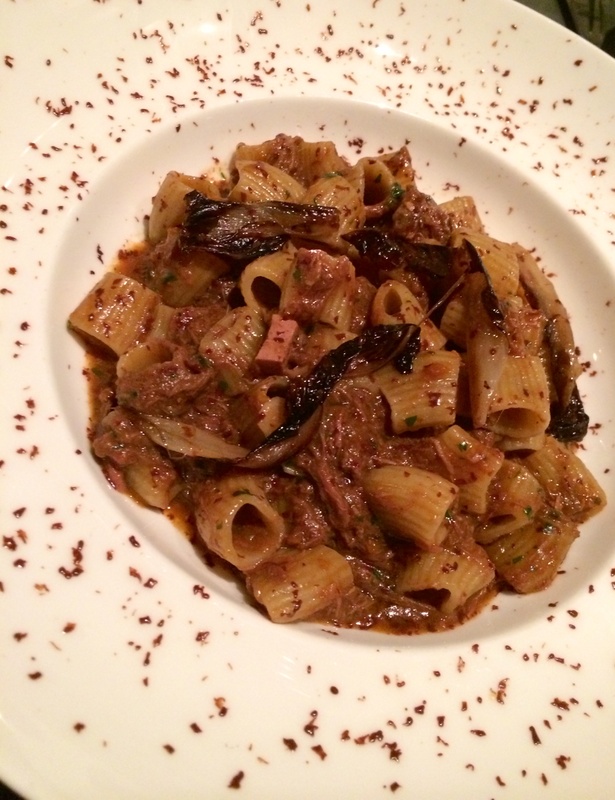 The Lumache with Aged Duck Ragu on the other hand had everything going for it – sweetness from chocolate, bitterness from treviso (a version of radicchio), richness from (many a cup of) red wine and a solid prediction that this might well become the darling of the menu. Thanks to the morel mushrooms for their meaty texture and the preserved plums for their rich saltiness, it was almost impossible to believe that the woundrous Spring Pea Shoots were entirely vegetarian. And all I can say about the desert is that you had better pray that the Hazelnut Mousse with Chocolate Crème and Candied Hazelnuts wasn’t just a one-time replacement to the menu. Did someone just push all my buttons?